I am ready to admit that I am more of a foodie than a nutritionist. And as a food lover I am extremely grateful that “nutrition” came into my life. This is because I understand today, if I am not eating real and wholesome food than I am not really a foodie but a junk food addict. And junk foods are not REAL foods, they are food like substances. To learn how to stop overeating you must first learn the difference between real food and junk food. You can overeat junk foods but hardly ever overeat wholesome foods. Before following my passion for food and nutrition I did not really understand the relationship between our health and food. I thought I was eating to relieve hunger or eating for pleasure. But today I eat for the love the food and health. I understand sourcing, preparing and eating the right portion of any food would make me feel energetic, build my immune system and nourish the physiological systems of my body. Foods make me strong, beautiful and intelligent. Notice what you tend to overeat? When I was unaware about the relationship between health and food, I always overate, especially if the food was easily available, and it was hot, salty, spicy, oily and someone else made it. In another words I overate fast, frozen and restaurant made foods. My taste buds were completely taken over by MSG, sugar, processed fats and caffeine. I would say anything in defense of my habit of over eating. Unlearning overeating and re-adapting my taste buds to real food has been quite the journey. If you are given a plate that has brown rice, lightly cooked vegetables and/or raw salad you really can’t over eat. Real, wholesome and freshly prepared foods will fulfil your hunger and satisfy your needs to nutrients. If you eat foods that are high in water content and were not overcooked, you are likely to over eat them. In another words making sure food is cooked preserving the water content and nutrients will satiate you. Fresh and raw foods also can fill up and make you feel satiated for two reasons – one, all the nutrients in the foods are present and two, you need to chew raw foods more than cooked meals which can tire you after a while and stop you from overeating. Make sure you are not thirsty. Sometimes we can mistake thirst for hunger. Drink plenty of water and eat hydrating foods to avoid over eating. Such as, squashes, melon, coconut water, cucumber, lettuce etc. When eating focus only on food. If you are eating and watching TV or working on the computer or conversing with your friend than you may overeat. When you give attention to eating only, you will derive more pleasure out of the experience and be satisfied eating a smaller portion. Add bigger portion of vegetables and smaller portions of grains, legumes and fats. This ratio will always guarantee satiety. Always add protein to every meal. Whether you are a vegan/vegetarian or non-vegetarian there are plenty of sources of protein rich foods. All vegetables contain high fiber. Eating high fiber foods reduces cravings. Try to avoid snacking in between meals – this is hard to discipline, so give up one time snacking first and then try not to snack at all between meals. Maybe add the snacks in your meals. If you can’t avoid snacking than switch snack items with green juices, smoothies and superfood juices. This will ensure more nutrients in the body and result in less hunger, less craving and no overeating. Eat three proper meals a days without skipping any one of them; otherwise your body will go on a starvation mode. You will eat more at your next meal. 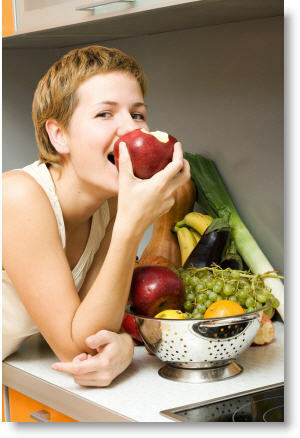 If you can eat at the same time every day you will not only never overeat but also lose weight if you need to. Sweet treats and baked desserts because they are low or zero in nutrition. Salty treats because they never fulfil our body’s need and contain low to zero nutrition. Canned, packaged, bottled, jarred and boxed foods that high in additives, preservatives, food colors and chemical. Again low to zero nutrition. These foods are unable to satiate our hunger. Example: sauces, jams, jelly, cookies, chocolates etc. Foods that are over cooked or over processed. Not much nutrition is left so our body hungers for more. A bonus point: lack of movement in life (exercise or just sitting for too long, also makes you overeat. As a foodie I am all about eating for pleasure as well as nutrition but I do keep in mind where I source my foods from and how I prepare it. I make homemade chocolate chip cookie, chocolate cupcakes and French fries at home too! Recipes coming up soon and once you taste home cooked recipes for cupcakes, cookies and fries, I promise that you will never find fast food delicious. Last thing to keep in mind is it takes about 15-20 minutes for your brain to understand that you have eaten your meal. Eating slowly will ensure that the “hunger feeling” is reduced and this will help you to avoid overeating. Have you ever heard anyone over eat vegetables? Do you think skinny people who over eat are healthy? Post your thoughts in the comment section and don’t forget to share if you have found it useful. There is no RIGHT DIET: Chose a lifestyle best 4 you!